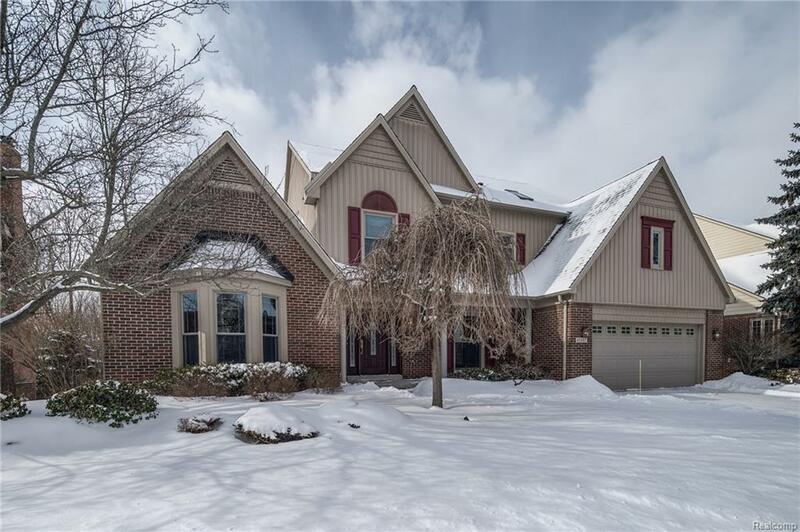 Gorgeous 4 bedroom 3.1 bath colonial sits on wooded lot in desirable Royal Crown Estates Subdivision with award-winning Northville schools. Foyer flows into private study with recessed lighting, & great room with dramatic cathedral ceilings & bay window that provides natural light. Formal dining room offers wooded views. Chefs eat-in kitchen features granite counter tops, large island, pendant lighting, wood cabinetry with soft close drawers, custom tile back splash and SS appliances. Sliding glass door access through kitchen opens to elevated custom cedar deck overlooking protected woodlands/wetlands. Family rooms boasts custom wood built-ins, gas fireplace with marble hearth, & wooded views through the floor to ceiling windows. Step-up master suite features cathedral ceilings, and his and her's walk-in closets. Master bath features double vanity, sunken tub, separate shower area, and natural sky light. This home offers endless features & upgrades, schedule a showing today!